This semester, for the larger Greenwich Village History Digital Archive, I would like to contribute an online exhibition that examines the Subject of the Artist School founded by artists Robert Motherwell, Barnett Newman, William Baziotes, David Hare and Mark Rothko at 35 East Eighth Street in Greenwich Village in 1949. These artists, who were all either associated with Abstract Expressionism or Surrealism, organized a series of lectures in order to convey the idea there was meaning in abstract art. It was this lecture series that endured after the school failed financially just a year after it opened its doors. Organized by professors from New York University, the series continued once the space became Studio 35. My research is in its beginning stages, but it seems this project will be a bit of a challenge since the school is often unfamiliar even to art historians. In fact, the school has usually only been mentioned briefly in footnotes. 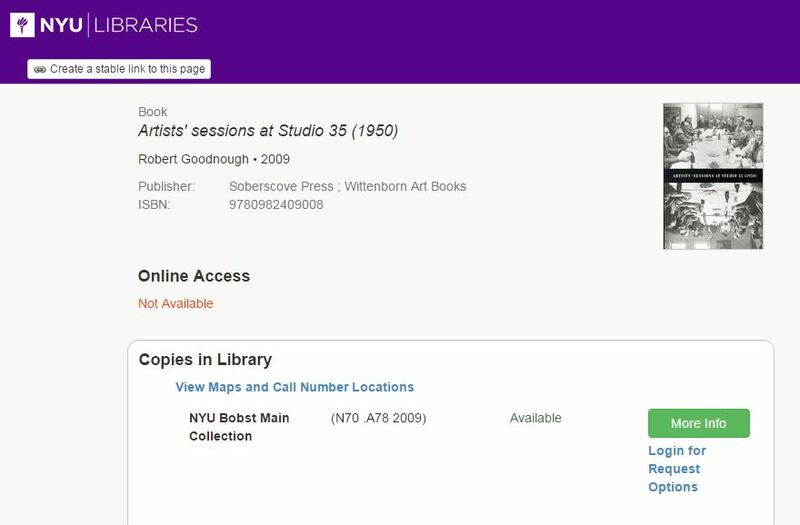 However, I have been able to find a few scholarly articles using Worldcat and at least book, Artists’ Sessions at Studio 35 (1950), all of which contain rich bibliographies that will lead to me to other sources. Additionally, I will look through the 1949-1950 issues of the Education Sun, the student newspaper for New York University’s School of Education at New York University’s University Archives, as well as contune searching through the artist collections of the Archives of American Art. While visiting the Archives of American Art’s website, I discovered a few transcribed interviews with artists who speak about the school’s mission. At least one of these interviews is in the public domain and readily available to use in my archive. These interviews are incredibly valuable resources for my project because they describe who attended the series and what events actually occurred during the meetings. Similarly, these artists’ estates may have primary sources that can reveal further details about this short-lived, experimental venture. New York University’s Bobcat database has been an essential tool during the beginning stages of my research. By completing this project I hope I can not only contribute an online entry that fills a hole in the course’s Greenwich History Blog and Archive, which is currently lacking in entries and exhibitions from the 1940s, but I also hope to fill a hole in the art historical literature, which, at this time, contains more information about Studio 35 than the Subject of the Artist School. Sources are limited, but I hope to be able to determine why these founders initially came together, what ideas they hoped to convey, what methods they used to convey their ideas, how their philosophies compared or related to other artist-run schools the time, who attended the school and lectures, and ultimately what was the lasting legacy of the short-lived venture.